Sadly I recieved emails today from Lori Arent and Dr Julia Ponder at The Raptor Center and the surviving osprey chick had to be euthanized after showing neurologial symptoms (seizures). She had just endured too much heat with too little food. There is really not much else to say. Very sad news. The sad news today is that the chick is not doing very well. I am not surprised, considering the length of time they were left up there without parents. (approx ten days in extreme heat). I tried my best to watch over them and stimulate some action. I care so much for each of these chicks that to lose any like this is painful to me. I watched them suffering and shared my observations every day with those in charge of the rescue at Three Rivers Park District. Please keep your fingers crossed for this little chick...lets hope for a miracle. "the one surviving chick had a tough night and is struggling this morning. Not surprising given its weakened condition and a pretty stressful day yesterday - while we were pleasantly surprised at its appearance when it presented, once the stress hormones abated, the chick was pretty down and out. The next 24 hours will be very telling as we see if the chick has enough reserves to respond to treatment. Relative to the adults, the best hypothesis (and an extremely strong one) is that the tower was hit by lightning while they were perched on it, resulting in acute, simultaneous death. The birds' bodies showed clear evidence of extensive electrical burns. Given the sources of electricity (or relative lack thereof) at the top of the cell tower, the only logical source was lightning. The towers are engineered extensively to withstand such a thing, so it is within reason to consider that it was hit, the birds electrocuted and no other significant signs occurred. He also answered my bigger question of how the chicks could survive in that situation (twigs would not be near enough insulation against a lightning bolt) . Given how the nest was suspended within the structure and the composition of the tower, he suggested it basically acted like a Faraday cage or shield (similar to being in your car during a lightening strike)." 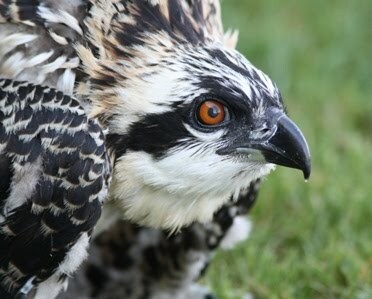 There has been a sad story evolving on an Osprey nest on a cell tower in the western suburbs. A pair of adults were seen lying dead on the side of the cell tower and there were three chicks alive in the nest. A rescue was organized about 5 days after the adults were presumed to have died, permits were acquired, but at the last minute Three Rivers Park District wildlife staff decided not to proceed with the intervention. They saw another adult landing on the nest and were hoping they would feed the chicks. It is unusual for an Osprey to feed chicks that are not their own, although I have seen it happen on several occasions, usually when the male died and the female was left alone caring for chicks. These few males undertook this feeding as a way to secure a mate and a territory, so it was an investment in the future. I went and visited the nest to watch and see if the chicks were getting fed. On my first visit there were 3 chicks and I saw a male drop one fish for the chicks. There was a great deal of aggression between the chicks as they fought for the food. The next time I visited the nest I could only see two chicks. It appeared that we had lost one already. The temps were unusually high during this period, reaching 99 on some days. It is hard for chicks to stay hydrated without enough food in that kind of weather. I did see a male drop one small fish during that visit also, but it was clearly not enough to sustain them. Every time I visited the nest I shared my observations with Three Rivers Park District. I recommended that the intervention be put back into action but I recieved no response. On my third visit the two chicks were laying down and seemed lethargic. One of them never got up and seemed to lift its head only occasionally and beg for food. The other was stronger and got up and walked around briefly. Again I shared my observations with the park district and asked about the rescue plans. I got no response. On my fourth visit I found no chicks and the dead bodies of the adults were gone. I recieved an email on my Facebook page telling me that a rescue was done and there was only one chick alive. The parents were determined to have died from electrocution. The one surviving chick is at The Raptor Center to be fed and hydrated. It is hoped that it can recover and be put on another nest as a foster chick. It is a difficult time in a chicks life for this kind of thing to happen as she is approaching fledging age. I have my fingers crossed for her. She is in good hands at the Raptor Center. Thanks to them and the American Tower company for intervening in this tragic situation.